Home / GST-Tally / TallyERP.9 Lessons / How to Create Sales to SEZ under GST in Tally? How to Create Sales to SEZ under GST in Tally? SEZ means Special Economic Zone. Some companies are registered under SEZ Zone and most of them will get special exemption under Income Tax & other taxes. The Sale of Goods and Services to a party in a SEZ can be recorded using sales voucher. 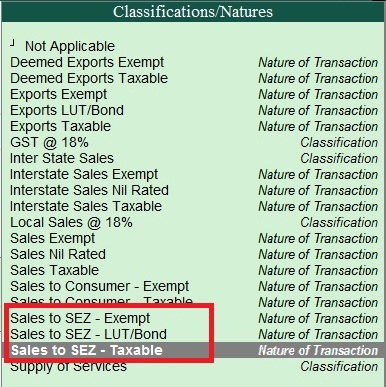 In an SEZ sales transaction, taxes are applicable on type of sales. Taxable SEZ Sale: In SEZ sales, IGST tax is appilcable for both local and intrastate parties. SEZ Sale under LUT/ Bond is applicable. SEZ Sales under LUT/Bond are allowed when you have signed up a letter of undertaking with the department for the sale of goods without the payment of Taxes. To provide details of the LUT/ Bond enable the options Enable Goods and Service Tax (GST)? and Set Alter GST Details in Statutory & Taxation. 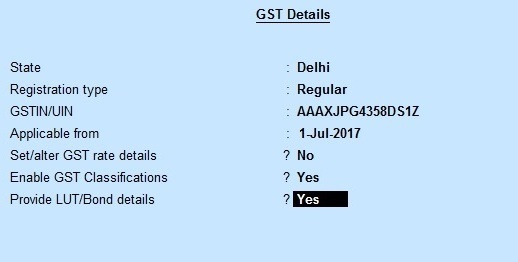 In the company GST Details screen, enable the option provide LUT/ Bond details and enter the details in the LUT/ Bond Details screen.